Biomass is considered greenhouse gas (GHG) neutral. The carbon dioxide (CO2) released from biomass during production of bioenergy is from carbon that circulates the atmosphere in a loop through the process of photosynthesis and decomposition. Therefore, production of bioenergy does not contribute extra CO2 to the atmosphere like fossil fuels. Fossil fuels are a finite resource, developed through geological processes over millions of years and their use represents a one-way flow of GHGs from beneath the earth's surface to the atmosphere. The extent of GHG emissions reduction varies widely and depends on many factors including the biomass (feedstocks) used, how they are produced and procured and the type and efficiency of the technology used to produce bioenergy. Generally, GHG emissions reduction from bioenergy systems is greatest where waste biomass is converted to heat or combined heat and power in modern plants located near to where the waste is generated. Bioenergy's GHG reduction benefits are potentially greater than those of other renewables. For example, stubble that is destined to be burnt in the field, can be harvested and combusted in an emissions controlled bioenergy plant. Hence, GHG emissions reductions are made twice – once in the field through reduced burning and again through fossil fuel substitution from bioenergy production. Considerable research is underway around the world to quantify the total lifecycle impacts of various bioenergy and other renewable energy systems. 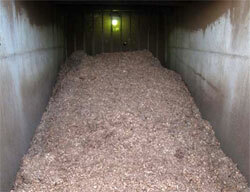 For example, through the IEA Bioenergy Task 38 project 'Greenhouse Gas Balances of Biomass and Bioenergy Systems'. Bioenergy is a renewable energy that can generate many additional benefits, the extent of which depends on a combination of factors including the types of feedstocks used, how they are produced and transported and the efficiency of the technologies deployed to convert them to bioenergy. Unlike most other renewable energy sources, biomass can generate both heat and electricity in a combined heat power (CHP) plant. This can then be used for a range of heating and cooling applications in industry, or for small communities. Bioenergy can provide air quality benefits where biomass residues that would otherwise be open-burnt in the field or forest, such as stubble, tree prunings or forest slash is removed and burnt in an advanced emissions controlled bioenergy plant. Petroleum-based fuels and petrochemicals can be harmful to the environment and are major surface and ground water-pollutants. Biofuels such as ethanol and biodiesel, are less toxic and are biodegradable. 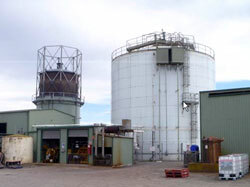 International and Australian studies indicate that bioenergy creates many ongoing jobs; generally more than most other types of renewable energy. Bioenergy helps stimulate regional economic development and employment by providing new, decentralised and diversified income streams from bioenergy and biomass production. This gives landholders more market options for their traditional agricultural and tree crops and for their use of waste streams such as manures. It may also open up opportunities to grow new crops, especially on marginal or low rainfall farmland, e.g. Juncea for biodiesel as a low rainfall break-crop . New employment opportunities arise from growing and harvesting biomass, transport, handling, and through procurement, construction, operation and maintenance of bioenergy plants. Using biomass can help build resilience in agricultural, timber and food-processing industries. Bioenergy provides a use for their waste streams, can help them reduce their energy costs and potentially add a new revenue stream if they can sell biomass-derived heat and/or export 'green' electricity to the grid. Using the right bioenergy technology in the right situation can help achieve greater cost savings than using fossil fuels. For example, areas that are reliant on LPG for heating (not linked to natural gas), areas remote from, or near the end of the power grid, subject to 'blackouts' and 'brownouts' and where electricity transmission losses and costs to upgrade the power supply are high. Using waste streams to generate bioenergy saves the environmental and economic costs of disposal in landfills and reduces contamination risks. Rural and regional energy reliability and security can be enhanced by providing a domestic energy source that can run continuously, or at peak times as required by the electricity market, with greater flexibility to ramp up production at short notice than large coal-fired plants. There's a growing range of proven, adaptable technologies available for converting biomass into heat, electricity and biofuels. Bioenergy and biofuel production can link with the development of other bioproducts and biotechnologies. For example, organic digestates produced as a bi- product of anaerobic digestion, can be used as a fertiliser or soil enhancer. Biomass can produce useful chemicals as part of an integrated biorefinery system – similar to an oil refinery. Bioenergy production can provide an alternative to prescribed burning of forests. Mechanical thinning and biomass removal for bioenergy can be used as a technique to reduce hazardous fuel levels, especially in areas where the cost and risks associated with prescribed burning are high. Water quality benefits have also been recorded where fuel reduction burning is replaced with biomass harvesting. For these reasons, biomass harvesting and removal for bioenergy and other small wood applications is a technique widely used in forests and woodlands in the USA. Bioenergy crops can be grown in areas that benefit from the additional vegetation cover. For example, trees can be grown and harvested for their woody biomass on farms in configurations that provide farm shelter, shade, salinity control, biodiversity and carbon sinks. 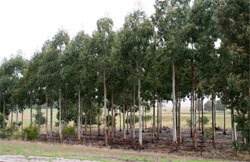 Species such as Mallee eucalypts are widely grown in Australia and, due to their ability to coppice, (re-shoot), are able to be repeatedly harvested and regrown to provide renewable energy and other regional and on- farm benefits. When well made, biochar can enrich soils, acting as a stable carbon sink for anywhere between 100-2,000 years. However, some of the more basic biochar pyrolysers, such as beehive burners and partially sealed smouldering wood stacks, can produce toxic gases and powerful greenhouse gases, such as methane. This result negates biochar's carbon sequestering benefits. Well designed, modern pyrolysers can, however, capture and convert methane and hydrogen gases to renewable energy and manage emissions. Biochar systems need to complete life cycle analyses to determine their climate mitigation potential using internationally accepted protocols. The International Biochar Initiative, (IBI) is preparing globally-developed and accepted standards for biochar characterisation and the development of standards pertaining to biochar production and utilisation. Biochar is a stable form of charcoal produced from heating organic materials such as wood or agricultural residues in low oxygen conditions, known as pyrolysis and gasification. 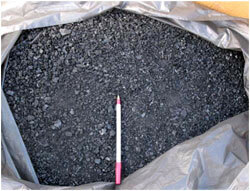 Production of biochar through pyrolysis also yields bioenergy in the form of heat and bio-oil in varying amounts depending on the temperature and pyrolysis process used. Biochar can also be produced through gasification though biochar yields are typically only around 1%, the bulk of the end product being syngas. Syngas, (also known as wood gas or synthesis gas) consists of a variety of gases, including hydrogen and carbon monoxide, which can be captured, cleaned and combusted to produce heat and/or power.